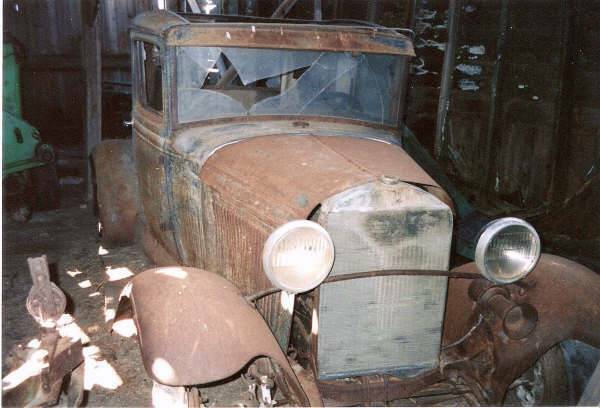 Old Ford Model A Photo Picture Classic Cars for sale & Classifieds - Buy Sell Classic Car & Classic Truck Classifieds. Johnny sent thses photos from an old farmhouse in central Illinois that hides a couple of old rusty rides, and says these cars have been sitting there for years. say maybe 31-32 with the Headlights.original OOgah horn too! Better sitting there than in a crusher. love it, love it, love it,, hope its not still sitting there. All though I'm a Chevy fan, I really like the old model A's and T's. Looks to be a good start.A 32 grill looks better on them than the model A does IMO if making a street rod.This one is missing so I would look for a 32.I know its a 30 or 31 from the cowl that looks more like a 32 Ford.